The Dettol No-Touch Hand Soap Refill is enriched with moisturising ingredients to help care for your skin - and it kills 99.9% of bacteria. • Helps stop the spread of bacteria. • Automatically senses your hands. • No drip, no mess. • Also available in Cleansing Green Tea & Ginger, Refreshing Grapefruit Essence. • Includes dispenser, hand wash refill and 4 x AA batteries. Wet hands with warm water, run hand under motion sensor and await the soap to dispense onto hands, rise with clean warm water. 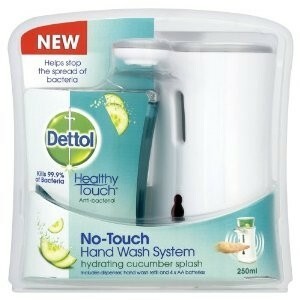 My sister gave it tome as a present because i love and washes and this Dettol No-Touch Hand Wash System Hydrating Cucumber Splash is easy to use, i love the fact that you don't need to touch the product in order for it to work it, simply put your hand/palm under it to release the hand wash, by the way the hand wash has a lovely fresh cucumber scent and i mainly place this product by the sink in my kitchen so i can use before i cook or after i clean, i also like the Dettol brand because it kills 99% of bacteria and it is one of my favourite brands. I love this product and highly recommend for sensitive people or people who wants to clean their hands fast and effectively. This is my favorite hand wash as you don't have to touch the pump which means my hands don't get as many germs.